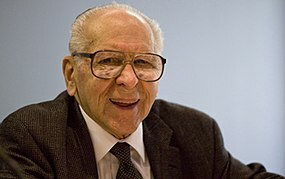 Thomas Stephen Szasz ( /sɑːs/ SAHSS; Hungarian : Szász Tamás István [saːs] ; 15 April 1920 – 8 September 2012) was a Hungarian-American academic, psychiatrist and psychoanalyst. He served for most of his career as professor of psychiatry at the State University of New York Upstate Medical University in Syracuse, New York. A distinguished lifetime fellow of the American Psychiatric Association and a life member of the American Psychoanalytic Association, he was best known as a social critic of the moral and scientific foundations of psychiatry, as what he saw as the social control aims of medicine in modern society, as well as scientism. His books The Myth of Mental Illness (1961) and The Manufacture of Madness (1970) set out some of the arguments most associated with him. Hungarian is a Finno-Ugric language spoken in Hungary and several neighbouring countries. It is the official language of Hungary and one of the 24 official languages of the European Union. Outside Hungary it is also spoken by communities of Hungarians in the countries that today make up Slovakia, western Ukraine (Subcarpathia), central and western Romania (Transylvania), northern Serbia (Vojvodina), northern Croatia and northern Slovenia. It is also spoken by Hungarian diaspora communities worldwide, especially in North America and Israel. Like Finnish and Estonian, Hungarian belongs to the Uralic language family. With 13 million speakers, it is its largest member in terms of speakers. A psychiatrist is a physician who specializes in psychiatry, the branch of medicine devoted to the diagnosis, prevention, study, and treatment of mental disorders. Psychiatrists are medical doctors, unlike psychologists, and must evaluate patients to determine whether their symptoms are the result of a physical illness, a combination of physical and mental ailments, or strictly psychiatric. A psychiatrist usually works as the clinical leader of the multi-disciplinary team, which may comprise of psychologists, social workers, occupational therapists and nursing staff. Psychiatrists have broad training in a bio-psycho-social approach to assessment and management of mental illness. Involuntary commitment or civil commitment is a legal process through which an individual who is deemed by a qualified agent to have symptoms of severe mental disorder is ordered by a court into treatment in a psychiatric hospital (inpatient) or in the community (outpatient). Civil libertarianism is a strain of political thought that supports civil liberties, or which emphasizes the supremacy of individual rights and personal freedoms over and against any kind of authority. Civil libertarianism is not a complete ideology—rather, it is a collection of views on the specific issues of civil liberties and civil rights. Self-ownership is the concept of property in one's own person, expressed as the moral or natural right of a person to have bodily integrity and be the exclusive controller of one's own body and life. Self-ownership is a central idea in several political philosophies that emphasize individualism, such as liberalism and anarchism. The University of Cincinnati is a public research university in Cincinnati Ohio. Founded in 1819 as Cincinnati College, it is the oldest institution of higher education in Cincinnati and has an annual enrollment of over 44,000 students, making it the second largest university in Ohio. It is part of the University System of Ohio. In 1962 Szasz received a tenured position in medicine at the State University of New York. Szasz had first joined SUNY in 1956. The State University of New York is a system of public institutions of higher education in New York, United States. It is the largest comprehensive system of universities, colleges, and community colleges in the United States, with a total enrollment of 424,051 students, plus 2,195,082 adult education students, spanning 64 campuses across the state. Led by Chancellor Kristina M. Johnson, the SUNY system has 91,182 employees, including 32,496 faculty members, and some 7,660 degree and certificate programs overall and a $10.7 billion budget. "Mental illness" is an expression, a metaphor that describes an offending, disturbing, shocking, or vexing conduct, action, or pattern of behavior, such as packaged under the wide-ranging term, schizophrenia, as an "illness" or "disease". Szasz wrote: "If you talk to God, you are praying; If God talks to you, you have schizophrenia. If the dead talk to you, you are a spiritualist; If you talk to the dead, you are a schizophrenic." :85 He maintained that, while people behave and think in disturbing ways, and those ways may resemble a disease process (pain, deterioration, response to various interventions), this does not mean they actually have a disease. To Szasz, disease can only mean something people "have", while behavior is what people "do". Diseases are "malfunctions of the human body, of the heart, the liver, the kidney, the brain" while "no behavior or misbehavior is a disease or can be a disease. That's not what diseases are." Szasz cited drapetomania as an example of a behavior that many in society did not approve of, being labeled and widely cited as a disease. Likewise, women who did not bend to a man's will were said to have hysteria. He thought that psychiatry actively obscures the difference between behavior and disease in its quest to help or harm parties in conflicts. He maintained that, by calling people diseased, psychiatry attempts to deny them responsibility as moral agents in order to better control them. Szasz's conception of disease exclusively in terms of "lesion", i.e. morphological abnormality is arbitrary and his conclusions based on this idea represent special pleading. There are non-psychiatric conditions that remain defined solely in terms of syndrome , e.g. migraine, torticollis, essential tremor, blepharospasm, torsion dystonia. Szasz's scepticism regarding syndromally defined diseases – only in relation to psychiatry – is entirely arbitrary. Many diseases that are outside the purview of psychiatry are defined purely in terms of the constellation of the symptoms, signs and natural history they present yet Szasz has not expressed any doubt regarding their existence. Is syndrome-based diagnosis only problematic for psychiatry but without issue for the remaining branches of medicine? If syndrome-based diagnosis is unsound on account of its absence of objectivity then it must be generally unsound and not only for psychiatry. Szasz's criticism of syndrome-based diagnoses is divorced from a consideration of the history of medicine. In medicine (in general) diseases are defined in terms of a multitude of criteria, these include: (a) morbid anatomy, e.g., mitral stenosis, cholecystitis; (b) histologically, e.g., most cancers, Alzheimer's disease; (c) infective organism, e.g. Tuberculosis, Measles; (d) physiologically, e.g. myasthenia gravis; (e) biochemically, e.g. aminoaciduria; (e) chromosomally, e.g. trisomy 21, Turner's syndrome; (f) molecularly, e.g. thalassemia; (g) genetically, e.g. Huntington's disease, cystic fibrosis; and (h) syndrome , e.g. migraine, torticollis, essential tremor, blepharospasm, torsion dystonia and most (so-called) mental disorders. The more objective definitions of disease – specified as (a) through (g) – became possible through the accumulation of scientific knowledge and the development of relevant technology. Initially the underlying pathology of some diseases was unknown and they were diagnosed only in terms of syndrome – no lesion could be demonstrated "by post-mortem examination of organs and tissues" (as Szasz requires) until later in history, e.g. malaria was diagnosed solely on the basis of syndrome until the advent of microbiology. A strict application of Szasz's criterion necessitates the conclusion that diseases such as malaria were "mythical" until medical microbiology arrives at which point they became "real". In this regard Szasz's criterion of disease is unsound by virtue of its contradictory results. Szasz concedes that some so-called mental illnesses may have a neurological basis – but adds that were such a biological basis discovered for these so-called mental illnesses, they would have to be reclassified from mental illnesses to brain diseases , which would vindicate his position. Shorter explains that the problem with Szasz's argument here is that it is the contention of biological psychiatry that so-called mental illnesses are actually brain diseases. Modern psychiatry has de facto dispensed with the idea of mental illness, i.e. the notion that psychiatric disease is mainly or entirely psychogenic is not a part of biological psychiatry. Szasz, T. (3 September 1988). "Koryagin and psychiatric coercion". The Lancet . 332 (8610): 573. doi:10.1016/S0140-6736(88)92700-6. PMID 2900959. Szasz, T S (16 December 1971). "More cruel than the gas chamber". New Society : 1213–1215. Szasz, T. (28 December 1991). "Diagnoses are not diseases". The Lancet . 338 (8782–8783): 1574–76. doi:10.1016/0140-6736(91)92387-H.
Szasz, Thomas (June 1993). "Curing, coercing, and claims-making: a reply to critics". The British Journal of Psychiatry . 162 (6): 797–800. doi:10.1192/bjp.162.6.797. Szasz, Thomas (June 2008). "Debunking antipsychiatry: Laing, law, and Largactil". Current Psychology . 27 (2): 79–101. doi:10.1007/s12144-008-9024-z. Szasz, Thomas S. (August 1975). "Medical metaphorology". American Psychologist . 30 (8): 859–61. doi:10.1037/0003-066X.30.8.859. Szasz, T. S. (October 1975). "The danger of coercive psychiatry". American Bar Association Journal . 61: 1246–48. PMID 11664493. Szasz, Thomas S. (May–June 1981). "Power and psychiatry". Society . 18 (4): 16–18. doi:10.1007/BF02701339. Szasz, Thomas (March–April 2004). "Protecting patients against psychiatric intervention". Society . 41 (3): 7–9. doi:10.1007/BF02690175. Szasz, Thomas (July–August 2004). "Pharmacracy in America". Society . 41 (5): 54–58. doi:10.1007/BF02688218. Szasz, Thomas (May–June 1994). "Mental illness is still a myth". Society . 31 (4): 34–39. doi:10.1007/BF02693245. Szasz, Thomas (September 2012). "Varieties of psychiatric criticism" (PDF). History of Psychiatry . 23 (3): 349–55. CiteSeerX 10.1.1.674.8694 . doi:10.1177/0957154X12450236. Szasz, Thomas (Spring 1998). "The healing word: its past, present, and future". Journal of Humanistic Psychology . 38 (2): 8–20. doi:10.1177/00221678980382002. Szasz T (September 1994). "Psychiatric diagnosis, psychiatric power and psychiatric abuse". Journal of Medical Ethics . 20 (3): 135–38. doi:10.1136/jme.20.3.135. PMC 1376496 . PMID 7996558. Szasz, T. (February 2003). "The cure of souls in the therapeutic state". The Psychoanalytic Review . 90 (1): 45–62. doi:10.1521/prev.90.1.45.22089. PMID 12898787. Szasz T (August 2003). "Psychiatry and the control of dangerousness: on the apotropaic function of the term "mental illness"". Journal of Medical Ethics . 29 (4): 227–30. doi:10.1136/jme.29.4.227. PMC 1733760 . PMID 12930856. Szasz TS (4 March 1978). "Psychiatry and dissent". The Spectator . 240 (7809): 12–13. PMID 11665013. Archived from the original on February 23, 2014. "The politics of mental illness". The Spectator : 9. 31 March 1978. Szasz T (25 April 2006). "Secular humanism and "scientific psychiatry"". Philosophy, Ethics, and Humanities in Medicine. 1 (1): E5. doi:10.1186/1747-5341-1-5. PMC 1483825 . PMID 16759353. "Law and psychiatry: The problems that will not go away". Journal of Mind and Behavior . 11 (3–4): 557–63. 1990. Soviet psychiatry: the historical background. Inquiry .5 December 1977:4–5. "Soviet psychiatry: its supporters in the West". Inquiry : 4–5. 2 January 1978. "Soviet psychiatry: winking at psychiatric terror". Inquiry : 3–4. 6 February 1987. "The therapeutic state: the tyranny of pharmacracy" (PDF). The Independent Review . V (4): 485–521. Spring 2001. ISSN 1086-1653 . Retrieved 20 January 2012. "Toward the therapeutic state". The New Republic : 26–29. 11 December 1965. Szasz, T. (March 1993). "Crazy talk: Thought disorder or psychiatric arrogance?". British Journal of Medical Psychology . 66 (4): 61–67. doi:10.1111/j.2044-8341.1993.tb01726.x. PMID 8485078. "Psychiatry, anti-psychiatry, critical psychiatry: what do these terms mean?". Philosophy, Psychiatry, & Psychology . 17 (3): 229–32. September 2010. Psychiatric hospitals, also known as mental hospitals, mental health units, mental asylums or simply asylums, are hospitals or wards specializing in the treatment of serious mental disorders, such as major depressive disorder, schizophrenia and bipolar disorder. Psychiatric hospitals vary widely in their size and grading. Some hospitals may specialize only in short term or outpatient therapy for low-risk patients. Others may specialize in the temporary or permanent care of residents who, as a result of a psychological disorder, require routine assistance, treatment, or a specialized and controlled environment. Patients are often admitted on a voluntary basis, but people whom psychiatrists believe may pose a significant danger to themselves or others may be subject to involuntary commitment. Psychiatric hospitals may also be referred to as psychiatric wards or units when they are a subunit of a regular hospital. 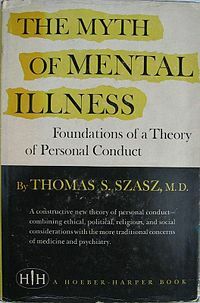 The Myth of Mental Illness: Foundations of a Theory of Personal Conduct is a 1961 book by the psychiatrist Thomas Szasz, in which the author criticizes psychiatry and argues against the concept of mental illness. It received much publicity, and has become a classic, well known as an argument against the tendency of psychiatrists to label people who are "disabled by living" as "mentally ill". There was systematic political abuse of psychiatry in the Soviet Union, based on the interpretation of political opposition or dissent as a psychiatric problem. It was called "psychopathological mechanisms" of dissent. Medicalization or medicalisation is the process by which human conditions and problems come to be defined and treated as medical conditions, and thus become the subject of medical study, diagnosis, prevention, or treatment. Medicalization can be driven by new evidence or hypotheses about conditions; by changing social attitudes or economic considerations; or by the development of new medications or treatments. Peter Roger Breggin is an American psychiatrist and critic of shock treatment and psychiatric medication. In his books, he advocates replacing psychiatry's use of drugs and electroconvulsive therapy with psychotherapy, education, empathy, love, and broader human services. Biological psychiatry or biopsychiatry is an approach to psychiatry that aims to understand mental disorder in terms of the biological function of the nervous system. It is interdisciplinary in its approach and draws on sciences such as neuroscience, psychopharmacology, biochemistry, genetics, epigenetics and physiology to investigate the biological bases of behavior and psychopathology. Biopsychiatry is that branch / speciality of medicine which deals with the study of biological function of the nervous system in mental disorders. Abram Hoffer was a Canadian biochemist, physician, and psychiatrist known for his "adrenochrome hypothesis" of schizoaffective disorders. According to Hoffer, megavitamin therapy and other nutritional interventions are potentially effective treatments for schizophrenia and other diseases. Hoffer was also involved in studies of LSD as an experimental therapy for alcoholism and the discovery that high-dose niacin can be used to treat high cholesterol and other dyslipidemias. Hoffer's ideas about megavitamin therapy to treat mental illness are not accepted by the medical community. Deinstitutionalisation is the process of replacing long-stay psychiatric hospitals with less isolated community mental health services for those diagnosed with a mental disorder or developmental disability. In the late 20th century, it led to the closure of many psychiatric hospitals, as patients were increasingly cared for at home or in halfway houses, clinics and regular hospitals. The biopsychiatry controversy is a dispute over which viewpoint should predominate and form a basis of psychiatric theory and practice. The debate is a criticism of a claimed strict biological view of psychiatric thinking. Its critics include disparate groups such as the antipsychiatry movement and some academics. Child and adolescent psychiatry or pediatric psychiatry is a branch of psychiatry that focuses on the diagnosis, treatment, and prevention of mental disorders in children, adolescents, and their families. It investigates the biopsychosocial factors that influence the development and course of these psychiatric disorders and treatment responses to various interventions. The Citizens Commission on Human Rights International (CCHR) is a nonprofit organization established in 1969 by the Church of Scientology and psychiatrist Thomas Szasz, headquartered in Los Angeles, California. Its stated mission is to "eradicate abuses committed under the guise of mental health and enact patient and consumer protections." Many critics regard it as a Scientology front group whose purpose is to push the organization's anti-psychiatric agenda. The Critical Psychiatry Network (CPN) is a psychiatric organization based in the United Kingdom. It was created by a group of British psychiatrists who met in Bradford, England in January 1999 in response to proposals by the British government to amend the 1983 Mental Health Act (MHA). They expressed concern about the implications of the proposed changes for human rights and the civil liberties of people with mental health illness. Most people associated with the group are practicing consultant psychiatrists in the United Kingdom's National Health Service (NHS), among them Dr Joanna Moncrieff. A number of non-consultant grade and trainee psychiatrists are also involved in the network. Joanna Moncrieff is British psychiatrist and a leading figure in the Critical Psychiatry Network. She is a prominent critic of the modern 'psychopharmacological' model of mental disorder and drug treatment, and the role of the pharmaceutical industry. She has written papers, books and blogs on the use and over-use of drug treatment for mental health problems, the mechanism of action of psychiatric drugs, their subjective and psychoactive effects, the history of drug treatment, and the evidence for its benefits and harms. She also writes on the history and politics of psychiatry more generally. Her best known books are The Myth of the Chemical Cure and The Bitterest Pills. As long as psychiatry has existed it has been subject to controversy. Psychiatric treatments are sometimes seen to be ultimately more damaging than helpful to patients. Psychiatry is often thought to be a benign medical practice, but at times is seen by some as a coercive instrument of oppression. Psychiatry is seen to involve an unequal power relationship between doctor and patient, and critics of psychiatry claim a subjective diagnostic process, leaving much room for opinions and interpretations. In 2013, psychiatrist Allen Frances said that "psychiatric diagnosis still relies exclusively on fallible subjective judgments rather than objective biological tests". Every society permits compulsory treatment of mental patients. ↑ Carey, Benedict (12 September 2012). "Dr Thomas Szasz, Psychiatrist who led movement against his field, dies at 92". The New York Times . 1 2 "Greatest Public Service Benefiting the Disadvantaged". Jefferson Awards for Public Service . Retrieved 2 August 2013. 1 2 3 4 5 6 Buchanan-Barker, P; Barker, P (February 2009). "The convenient myth of Thomas Szasz". Journal of Psychiatric and Mental Health Nursing. 16 (1): 87–95. doi:10.1111/j.1365-2850.2008.01310.x. PMID 19192090. ↑ Knoll, James (13 September 2012). "In Memoriam – Thomas Stephen Szasz, MD". Psychiatric Times . ↑ Szasz, Thomas (2008). Psychiatry: the science of lies. Syracuse University Press. pp. 2–5. ISBN 978-0815609100. ↑ "Thomas Stephen Szasz biography – psychiatrist, libertarian, renegade to psychiatry". FTR books. October 19, 1951. Archived from the original on August 15, 2002. Retrieved September 26, 2011. ↑ "Introduction". Szasz. Retrieved September 26, 2011. 1 2 3 Oliver, Jeffrey (Summer 2006). "The Myth of Thomas Szasz". The New Atlantis . 13 (13): 68–84. PMID 17152134. ↑ Szasz, Thomas (February 1958). "Psychiatry, Ethics, and the Criminal Law". Columbia Law Review. 58: 183–198. ↑ Phillips, James; et al. (January 13, 2012). "The Six Most Essential Questions in Psychiatric Diagnosis: A Pluralogue. Part 1: Conceptual and Definitional Issues in Psychiatric Diagnosis". Philosophy, Ethics, and Humanities in Medicine. 7 (3): 3. doi:10.1186/1747-5341-7-3. PMC 3305603 . PMID 22243994. 1 2 3 Szasz, Thomas Stephen (1973). The second sin. Anchor Press. ↑ Szasz, Thomas S. (1974). "7 Language and Protolanguage". The Myth of Mental Illness: Foundations of a Theory of Personal Conduct (revised ed.). New York: Harper & Row Publishers. pp. 117–19. ISBN 978-0060911515. The significance of the affective use of body language – or generally, of the language of illness – can hardly be exaggerated.... It is part of our social ethic that we ought to feel sorry for sick people and should try to be helpful to them. Communications by means of body signs may therefore be intended mainly to induce the following sorts of feelings in the recipient: "Aren't you sorry for me now? You should be ashamed of yourself for having hurt me so! You should be sad seeing how I suffer...." and so forth.... [T]he flamboyant "schizophrenic body feelings" encountered today, represent communications in the contexts of specific social situations. Their aim is to induce mood rather than to convey information. They thus make the recipient of the message feel as if he had been told: "Pay attention to me! Pity me! Scold me!" and so forth.... [C]hildren and women often can get their way with tears where their words would fall on deaf ears – and so can patients with symptoms. The point is that when some persons in some situations cannot make themselves heard by means of ordinary language – for example, speech or writing – they may try to make themselves heard by means of protolanguage, for example, weeping or "symptoms".... We have come thus to speak of all these silent and not-so-silent cries and commands, pleas and reproaches – that is, of all these endlessly diverse "utterances" – as so many different mental illnesses! ↑ Lelli, Valeria (2011). "The body language: a semiotic reading of Szasz' Anti-psychiatry" (PDF). Dialogues in Philosophy, Mental and Neuro Sciences. 4 (2): 34–36. ↑ "My Madness Saved Me: The Madness and Marriage of Virginia Woolf". ↑ "The Nazis sought to prevent Jewish suicides. Wherever Jews tried to kill themselves – in their homes, in hospitals, on the deportation trains, in the concentration camps – the Nazi authorities would invariably intervene in order to save the Jews' lives, wait for them to recover, and then send them to their prescribed deaths." quotation from Kwiet, K.: "Suicide in the Jewish Community", in Leo Baeck Yearbook, vol. 38. 1993. ↑ Klein, Daniel B. (1993). "[Book Review] Our Right to Drugs: A Case for a Free Market" (PDF). Southern Economic Journal. 59 (3): 552–53. doi:10.2307/1060304. JSTOR 1060304. Archived from the original (PDF) on December 25, 2016. ↑ Baker, Robert (Winter 2003). "Psychiatry's Gentleman Abolitionist" (PDF). The Independent Review. VII (3): 455–60. ISSN 1086-1653 . Retrieved February 12, 2012. ↑ Jacob Sullum (July 2000). "Curing the Therapeutic State: Thomas Szasz interviewed by Jacob Sullum". Reason Magazine: 28 et seq. 1 2 Costigan, Lucy (2004). Social Awareness in Counselling. iUniverse. p. 17. ISBN 978-0-595-75523-3. 1 2 3 4 Fitzpatrick, Mike (August 2004). "From 'nanny state' to 'therapeutic state'". The British Journal of General Practice . 1 (54(505)): 645. PMC 1324868 . PMID 15517694. 1 2 3 4 Szasz, Thomas (Spring 2001). "The Therapeutic State: The Tyranny of Pharmacracy" (PDF). The Independent Review . V (4): 485–521. ISSN 1086-1653 . Retrieved January 20, 2012. ↑ Szasz, Thomas (2011). "The myth of mental illness: 50 years later" (PDF). The Psychiatrist. 35 (5): 179–82. doi:10.1192/pb.bp.110.031310 . Retrieved April 27, 2012. ↑ Fuller Torrey, Edwin (1988). Surviving schizophrenia: a family manual. Perennial Library. p. 315. ISBN 978-0-06-055119-3. ↑ Szasz, Thomas (June 1, 1971). "American Association for the Abolition of Involuntary Mental Hospitalization". American Journal of Psychiatry . 127 (12): 1698. doi:10.1176/ajp.127.12.1698. PMID 5565860. ↑ Szasz, Thomas (1971). "To the editor". American Journal of Public Health . 61 (6): 1076. doi:10.2105/AJPH.61.6.1076-a. ↑ Schaler, Jeffrey, ed. (2004). Szasz Under Fire: A Psychiatric Abolitionist Faces His Critics. Open Court Publishing. p. xiv. ISBN 978-0-8126-9568-7. ↑ "CCHR's Board of Advisors". Citizens Commission on Human Rights (CCHR). Archived from the original on November 28, 2005. Retrieved July 29, 2006. ↑ "Thomas Szasz speaks (Part 2 of 2)". All in the Mind. 11 April 2009. 1 2 Parker, Ian (2001). "Russell Tribunal on Human rights in Psychiatry & "Geist Gegen Genes", June 30 – July 2, 2001, Berlin". Psychology in Society. 27: 120–22. ISSN 1015-6046. ↑ "Honorary doctoral degrees". Universidad Francisco Marroquín . Retrieved May 1, 2012. ↑ R. E. Kendell (2005). "The Myth of Mental Illness". In Schaler, Jeffrey. Szasz Under Fire: The Psychiatric Abolitionist Faces His Critics (1st ed.). Illinois: Open Court. pp. 29–48. ISBN 978-0812695687. ↑ Shorter, Edward (May 2011). "Still tilting at windmills: Commentary on ... The myth of mental illness". The Psychiatrist. 35 (5): 183–84. doi:10.1192/pb.bp.111.034108. ↑ Szasz, Thomas (May 2011). "The myth of mental illness: 50 years later". The Psychiatrist. 35 (5): 179–82. doi:10.1192/pb.bp.110.031310. Bracken, Pat; Thomas, Philip (September 2010). "From Szasz to Foucault: On the Role of Critical Psychiatry" (PDF). Philosophy, Psychiatry, & Psychology . 17 (3): 219–28. Vatz, Richard (Summer 1973). "The myth of the rhetorical situation". Philosophy & Rhetoric . 6 (3): 154–61. JSTOR 40236848. Watts, Geoff (20 October 2012). "Thomas Stephen Szasz". The Lancet . 380 (9851): 1380. doi:10.1016/S0140-6736(12)61790-5. Williams, Arthur; Caplanemail, Arthur (20 October 2012). "Thomas Szasz: rebel with a questionable cause". The Lancet . 380 (9851): 1378–79. doi:10.1016/S0140-6736(12)61789-9. PMID 23091833.